Previously we have talked about reasons and preparing of visiting Russia, in this message we'll talk about applying for a visa. To enter the Russian Federation a foreign citizen must submit a valid identity document, accepted as such by the Russian Federation, and a visa, if no other order of entry into the Russian Federation is established by an international agreement. Valid identity document is your passport. Visa would be attached into your pass as a sticker. Procedure and terms of issue and provision of a visa, extending its validity period, reissue in case of loss as well as visa cancellation procedure are established by the Russian Federation Government Regulation № 335, adopted June 9, 2003 (with amendments and additions contained in the Government Regulation № 635, October 4, 2007). Fundamental provisions of the mentioned Procedure are in full conformity with the Agreement between the Russian Federation and the European Community on visa issue facilitation for nationals of the Russian Federation and the European Union that entered into force on June 1, 2007. Some law references you are not really interested at. We already know, that valid identity document, accepted as such by the Russian Federation is your passport, having at least two blank pages intended for the visa label. The passport must be valid for 6 months from the date of expiry of the visa. Visa application is a form which you have to fill here and print, but in some countries you get form as a empty sheet directly in Russian embassy. Photo should be with light background. the policy must be valid for the entire duration of the visa (in case of multiple-entry visas for citizens of the Schengen Agreement allowed to submit policy valid for the period of the first trip). The size of consular dues taken for issuing Russian visa is established on the basis of reciprocity. Consular due for the European 61 Union citizens is 35 euro for an ordinary visa, and it doubles in case of an urgent issue (within three days). To obtain a visa the visitor must have an original visa support letter ("priglashenie to the Russian Federation"), issued by one of the Federal Migration Service offices. The letter can be issued on application by a citizen of the Russian Federation, as well as by a foreign citizen or a stateless person residing in the Russian Federation, or by a legal entity. This is the most important part in getting a visa. Before you will go to Russian embassy, you have to find a person who would make you a support letter. It could be your Russian friend, University, employer or travel agency. Support letter would be for 20 days after your friend, employer etc will ask for it in Russian migration Service, then he have to pick it up and send to you. You will give it away to embassy worker with other documents. Depending on the number of authorized entries-departures, visas can be single, double or multiple-entry. It is necessary to know that the actual purpose of the entry of the foreign citizen must correspond to the type of the visa issued to him (her) . Very important note - for example, if you have private visa, you are not allowed to work, or you would be deported from Russia. The duration of stay of a foreigner in the territory of the Russian Federation is determined by the validity period of his (her) visa. 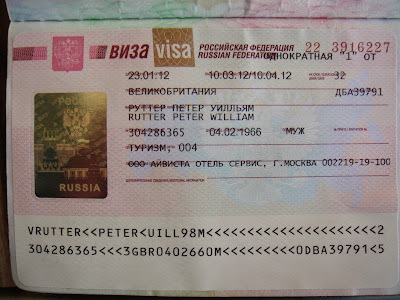 Days amount are written on your visa.In addition, the foreign citizens arriving to the Russian Federation on multiple-entry business visas or multiple-entry humanitarian one-year visas are authorized to stay on the territory of the Russian Federation summarily during not more than 90 days in each 180-day period. A foreign citizen, who did not leave the territory of the Russian Federation upon the date of the visa expiry or did not apply for its extension, can be brought to administrative responsibility (money penalty amounting for 2 000 up to 5 000 rubles) up to and including deportation from the Russian Federation and the sequential 5-year exclusion. With all needed documents you have to go to embassy or visa center, give documents to worker and wait 7-10 days. If you'll pay double due, your visa would be ready in 3 days.